The recipe for this Pumpkin Cheesecake is an adaption of my Creamy Vegan Cheesecake recipe, which was very popular with you guys, so I decided to take it one step further and build it into a two-layered cheesecake that looks and tastes amazing! My boyfriend and I devoured the whole cake within a few days (as we are both obsessed with cheesecakes), and the best thing is that we didn’t even have to feel guilty since it’s all wholesome ingredients! Now I know that there are a bunch of unfortunate souls out there that are allergic to nuts and cashews in particular, so I have to apologize in advance. In my defense they really are one of the best assets in plant-based cooking to achieve that dreamy-creamy texture. 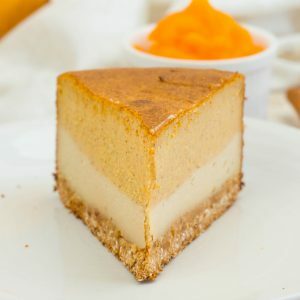 I still have to master a vegan cheesecake completely without nuts, but I do have some ideas on how to achieve a similar texture (soy yogurt/silken tofu) so stay tuned for that! 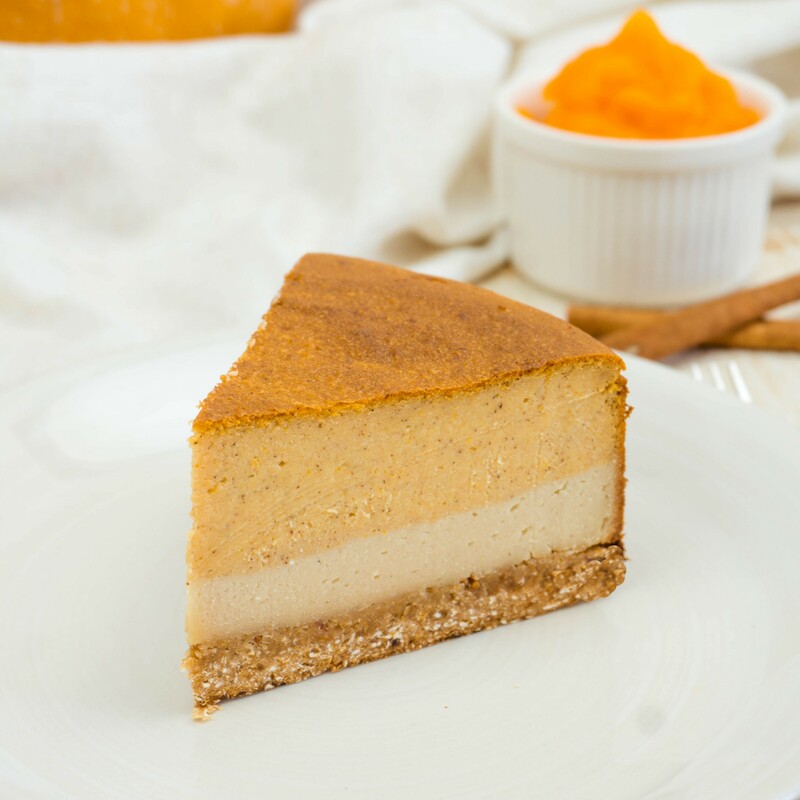 In the meantime, for anyone who is allergic to coconuts, you could give my Baked Cheesecake a try and simply use a different plant-based yogurt! Prepare the filling by simply adding all ingredients (except the pumpkin puree and cinnamon) to the blender and mixing on medium/high speed until smooth (use your tamper tool to mash it down). Once smooth, pour a little bit over ½ of the filling over the crust and spread evenly so you have a smooth surface. Place in the freezer for 15 minutes to set. Add the pumpkin puree and cinnamon to the remaining filling and blend until smooth. 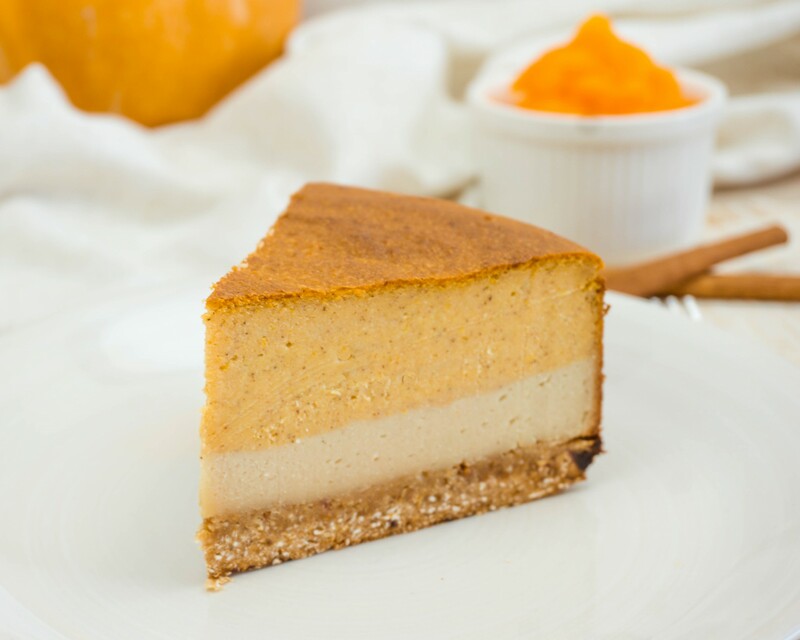 Carefully spoon the pumpkin filling on top of the first cheesecake layer and spread evenly (be careful otherwise the layers will mix). Place the cake in the oven and bake for 45-50 minutes. If your oven is very strong like mine and browns the surface too fast, make sure to turn the cake once in a while so it browns evenly. Once it's done, take it out, let cool down and store in the fridge for 6 hrs or overnight (it will firm up) before cutting it. This was my first attempt at a vegan cheesecake, and it turned out great! It would have turned out even better if I’d measured the pumpkin correctly … I added too much and the too became a little too wet so didn’t hold it’s shape when cut. The flavor is on point. Thank you for sharing this recipe! What size pan do you suggest using?